If you follow videofrog on Facebook, you’ll know that I’ve moaned about this before, but following the 90th Oscar Award nominations I feel that it’s time for a proper look at one of the greatest cinematographers working today, plus he’s British and by all accounts seems to be a very down to earth bloke. I first became aware of Roger Deakins through his work with the Coen Brothers, he’s been DOP on 12 of their films, including five that have been Oscar nominated; Fargo, O Brother, Where Art Thou, The Man Who Wasn’t There, No Country for Old Men and True Grit. He should have won for any of those, easily! The year he was nominated for No Country for Old Men he was also nominated for his work on The Assassination of Jesse James by the Coward Robert Ford; Deakins, of course, didn’t win for that either! With his early career based in documentaries, many of his films have a very naturalistic look. In Sicario you can almost feel the heat radiating from the screen in some of the scenes, compare that to the arrival at James Bonds family home in Skyfall, where the low cloud and muted colours leave you wanting to wrap-up and protect yourself. He has said that ‘people confuse pretty with good cinematography’ I don’t think any of the films I’ve watched with him as DOP could be described as ‘pretty’ they feel very real, immersive, and this is how Blade Runner 2049 made me feel too. Blade Runner 2049 is his 14th nomination for best cinematography, the third collaboration between him and Denis Villeneuve. Their past two films together Prisoners and Sicario also resulted in Oscars nominations for his cinematography. 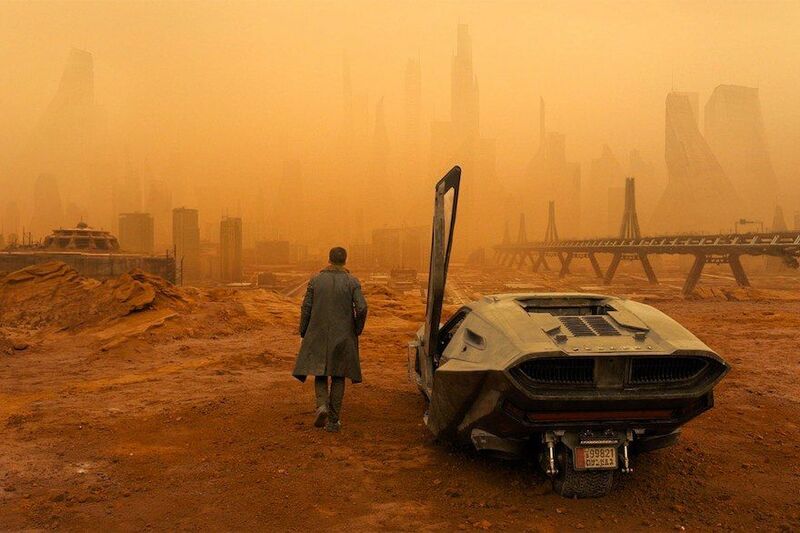 Blade Runner 2049 is a visually amazing film that takes you into its world, immerses you, and for the time you are sitting there you are in that world with the characters. I’m certain seeing on an IMAX screen helped, though I’m looking forward to watching it from the comfort of my sofa too. You would think that being the DOP on a science fiction film would take you away from your naturalistic style, however, one of the things that makes you believe in the world is the way that it seems natural, normal and completely believable. For this film, Deakins was onboard at the point of storyboarding. With the original film to which this was a sequel, there was a look and feel that needed to be echoed and developed, and Villeneuve and Deakins worked together to devise this. With the original film almost completely city bound, lit by rainsoaked neon and the feeling of pollution at every turn, the sequel was to deliver much more visually. We have again the rainsoaked neon environment of Los Angeles, both interiors and exteriors, but other locations show even more of Deakins naturalistic style - the protein farm, the orphanage and most stunningly, the ruins of a dust-filled Las Vegas. Natural lighting is used to striking effect, with one sequence in the Wallace Corporation’s Headquarters - the scene being lit using rippling pools of water to bounce light off the walls. Even though the subject matter is often harsh, the surroundings are believable and give depth to every scene and at no time do you feel that you are watching an artificial landscape, and for me, this is what made the cinematography work so well throughout the film. Roger Deakins is more than just a cinematographer. Some would suggest that his pulling power for actors and directors ranks him more alongside an auteur director, with both Josh Brolin (Sicario) and Ryan Gosling (Bladerunner 2049) stating that his involvement encouraged them to sign up for the films. However, this year he’s up against a tough field again. Rachel Morrison is the first woman to be nominated for Best Cinematogethary category for Mudbound which seems incredible, but not entirely surprising. He’s against the Oscar favourite of The Shape of Water and its cinematographer, Dan Laustsen. I’m desperate to see this film - it looks amazing on every level - could this be Guillermo del Toro’s year? Plus there is Hoyte van Hoytema nominated for Dunkirk, with Christopher Nolan receiving his first best director nod too. Dunkirk was a breathtaking film, I felt exhausted after watching it and working with IMAX cameras in those conditions could not have been easy. Place your bets, it should be Deakins’ year, but given that people have been saying that for a long time and this year the nominations were more unpredictable than they had been for years, I wouldn’t put my house on it! If you would like to read more about him, his work, and methodology, check out his site rogerdeakins.com. You can become a member for free; he shares his ‘musings’ and lighting plans, and it also features a forum in which he does respond to contributors questions, so you might be able to solve your camerawork issues with his help!